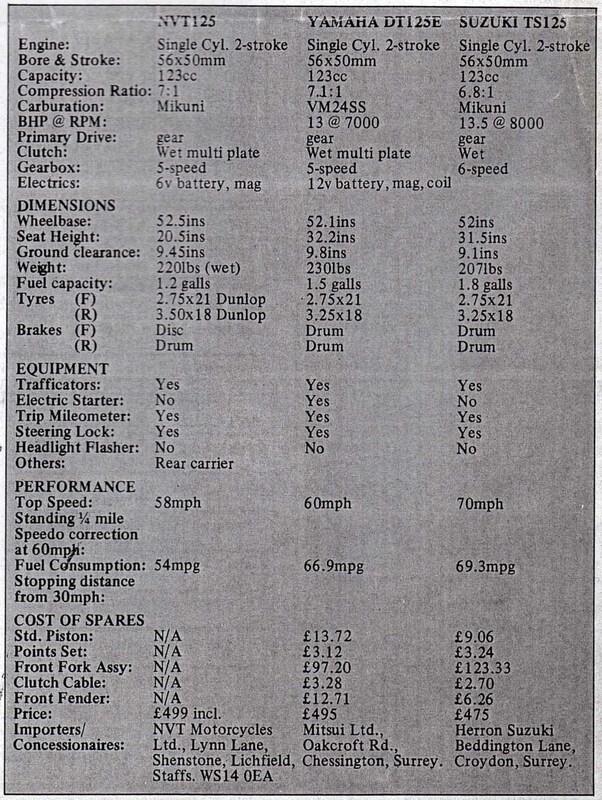 Here's the text of a road test from Jun 1978. 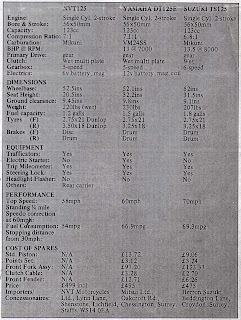 Which Bike - June 1978 - Supertest comparing the NVT 125 to the Yamaha DT125E and the Suzuki TS125. It has long been my opinion that manufacturers should own up to the fact that most of the lightweight trail/enduro bikes they produce never see the turf at all. People buy them for their looks, their zippy acceleration and handling, and their relative simplicity, but they do so at the expense of decent braking and solid road holding. Thus, with minimal effort, such machines could be suitably equipped for their real ultimate use before they leave the factory and a lot of riders would enjoy safer, balanced motorcycling. But no-one ever got the message. 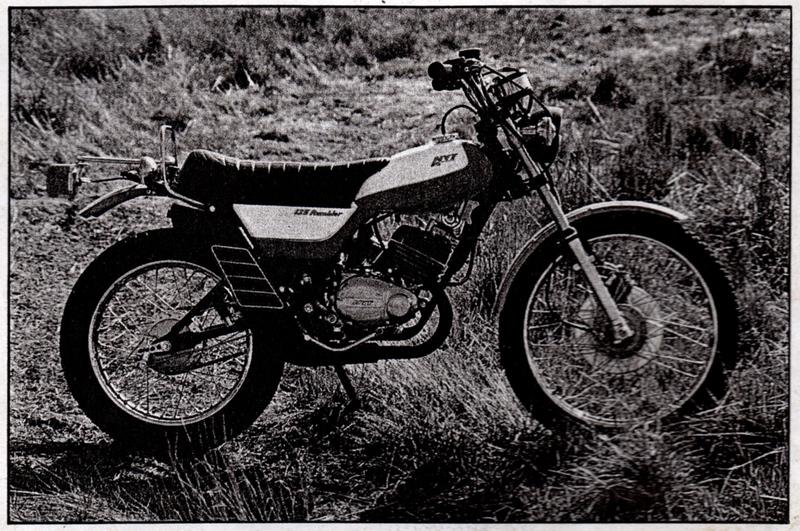 Until now that is, for NVT have come up with the Rambler, a bike that has the glean, cobby image of an off-road bike but is intended primarily for road use. Elsewhere in this issue you can learn of the background to this geographically hybrid little machine, but in reality the Rambler betrays little sign of its disparate ancestry. That in itself is a considerable achievement but to this must be added the fact that the bike is in no way inferior to firmly established opposition such as Suzuki’s TS125 and Yamaha’s DT125E, certainly as far as its role as a roadster is concerned, and that’s what this Supertest is all about. The big question prior to anyone actually seeing NVT’s new baby was "what will the engine be?" rumours of a Suzuki engine made under licence in Taiwan were second only to those assumptions made about a 6-speed Minarelli unit, but in the event they were both nonstarters. We know now that the motor is almost the same as that found in one of our other test models, the DT125 E, en electric-start version of the bike that’s been available here in several versions for nearly half a decade. The Rambler’s motor shares the same 56x60mm bore and stroke, 7:1 compression ratio, 7 port barrel, reed valve induction, geared primary drive, wet, multi-plate clutch, offside mounted crankshaft driven oil injection pump and five speed gearbox. The only differences seem to be the engine covers which are shaped slightly differently and aren’t etched with the legend Yamaha! The engine performance is therefore identical to the DT with a claimed 13 brake horsepower available at 7500rpm, although the Rambler’s handbook advises against revving beyond that figure, the DT’s redline isn’t until eight thou. The motor starts easily, the kickstart is somewhat awkwardly cranked to clear the silencer, and the choke can be dispensed with after a minute or two, and the gear selection is smooth and positive, ditto the clutch. The power band is deceptively wide thanks to the clever porting and reed valve, but and although it will pull quite willingly from 3000 - 3500 revs depending on the load, it really starts to fly around 5500 and will zoom on into the red in every gear. 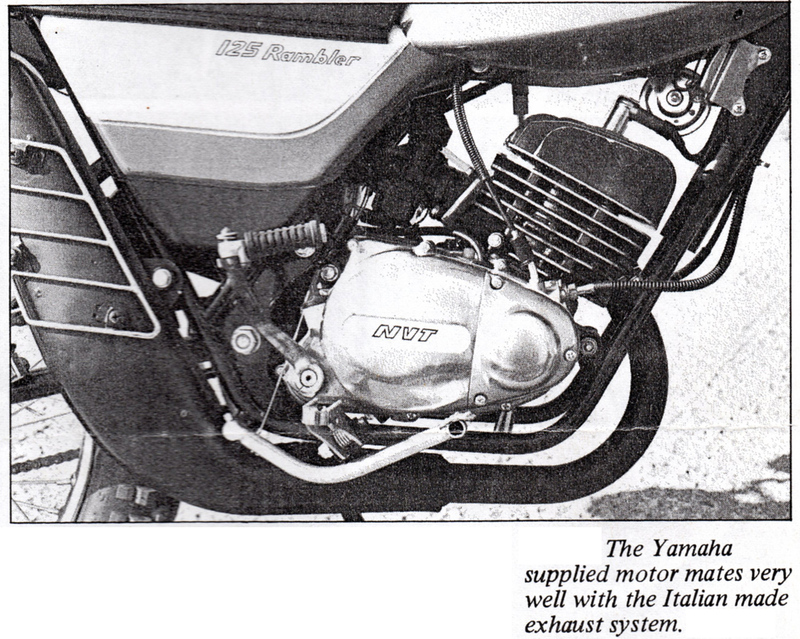 The 30.93:1 bottom gear is actually lower than it might necessarily be, and you notice the difference when you ride the Yamaha with its 27.78:1 ratio in first. But the both bikes suffer from a top gear that could actually be further away from fourth. The Rambler managed a top whack of 58 and would’ve gone further if we hadn’t been fond of the engine internals! The higher geared Yam pulled 60, incidentally, although it was 500rpm into the red at this point. The big difference between the Rambler and its rivals is, of course, the cantilever frame. A current trend rather than an engineering necessity, the monoshock chassis puts four times as much stress on the rear shock absorber as on conventional swinging arm shocks and much of this is compensated for by a stiffish spring rate, which is not adjustable. The ride is nonetheless as comfortable as either of the two Jap bikes, but, as might be expected, the roadholding is better. Given that all these three machines are shod with trials tyres — in this case Dunlop Trials Universals, which, along with the paint are just about the only truly British contributions to the Rambler’s inventory - the Rambler feels taut and secure on most road surfaces. 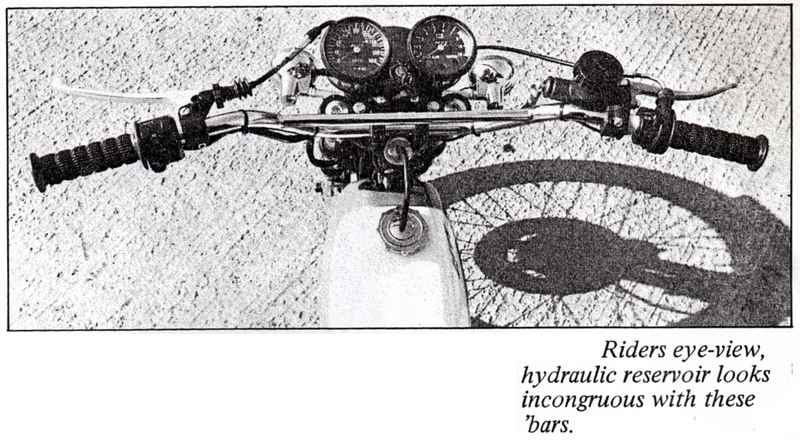 The Marzocchi front forks are well matched to the firmly sprung rear end and the net result is a steadier gait than can be enjoyed aboard the Yamaha or Suzuki, with less diving and weaving under braking. And the Rambler’s braking really is excellent. Because it has a (Grimeca) hydraulic disc at the front end, it stops shorter and surer than either of the other two with their small single leading shoe drums. It’s far more resistant to fade of course, too, and coupled with a 140mm rear drum which is strong but not at all insensitive, it means the Rambler can be cut-and-thrusted faster and more safely through heavy traffic or along twisty routes than the other two. On the subject of safety, the Rambler has a fairly efficient 25/25 watt CEV headlamp in a clever rubber shell and a horn that’s okay but hardly startling. Unlike the other two machines, the Rambler’s lighting is direct despite the provision of a 4 amp/hour 6 volt battery. The 1.2 gallon tank should afford a safe range of around sixty miles since we were quoted about 54 mpg and in this department the Rambler could clearly do with a larger tank - like those of the Suzuki and Yamaha. Although we’re far more concerned with road behaviour in this test, I took the opportunity of a brief tour de turf on the Rambler (with a name like that you have to, don’t you?). Frankly, it’s not at home off-road. There’s too much weight on the front end and the front brake is just too powerful for sensitive deceleration on muddy or loose surfaces. So it wasn’t easy to aviate the front end and I tended to understeer horribly into corners even after applying the merest sliver of front brake. (On the other hand the back end could be slid delightfully around those same corners with prudent jabbing of the rear brake). Looks? Well the styling is novel, but attractive and practical and although the tank, side panels and well tuned Lanfranconi exhaust system are all imported in bare metal from Italia, they’re finished to a very high standard right here in Blighty. The seat is generously wide but rather too short for the comfortable transport of two people sized people, and mounting the pillion rests on the bottom run of the cantilever means that your passenger needs very flexible knee joints. The solo riding position was excellent though and the controls all fell easily to hand and foot. All-in-all NVT have come up with a very good motorcycle first time around, which considering the talent they can call on, isn’t entirely surprising. When you take into account the delivery charges that have to be lumped on top of the Suzuki and Yamaha’s prices, the Rambler’s all in price tag of £499 puts it into the marketplace with an odds-on chance of success. A lot of people should be pleasantly surprised by NVT’s Rambler. another for several years, and they are backed up by much larger dealer networks than the British-built bike. If the ever-fickle biking public can overcome their admittedly justified reservations about small capacity British bikes and in any case such a description applies only loosely to the Rambler then it should do well, probably at the expense of Yamaha’s sales figures rather than Suzuki’s. For once Britain is on the right road.